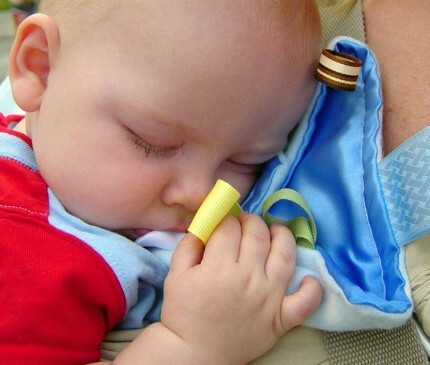 When we're out and about, I see sooooo many Mommies wearing their babies in ring slings the wrong way. I was fortunate to have a friend who was really familiar with how to correctly wear a ring sling show me how it was done. It seems a little daunting at first to get used to the sling and "juggling" the baby, but wearing the baby properly is a completely different, safer, & more comfortable experience than when it's not done right. It's definitely worth the time it takes to practice and learn how to do it properly. If you're not lucky enough to have a friend who is a baby wearing pro, you are lucky enough to "know" a blogger who is... me :) I've put together this list of resources so you can do a bit of homework. You'll be surprised at how quickly you get the hang of it! I wrote these instructions that I give out with the ring slings I sell. They cover how to get started and each of the carries. It's a good place to start, and if you're giving a sling as a gift, you'll definitely want to print them to include in the package. Watching someone put on a sling is the next best thing to having someone actually put one on you. The best place to watch... YouTube! I've listed my favorites below. They are really great instructional videos, but I'm considering making some of my own, not because I would do the instructions any better, but because there are some differences if you use an Elle Belle sling instead of the ones shown in the videos. My slings have a lot less fabric than these so threading the sling isn't quite as important/involved as they make it seem in the video. Also, the pleated shoulder on an Elle Belle sling helps it spread across your shoulder, so you don't have to "mess with" the shoulder part to spread it out like she does in the video. So those are the easiest and the carries I used the most. There are others though, like the back, cradle, and nursing carries that you may want to try out once you get the basic ones down. Now for the most common mistakes Mommies make. If you're uncomfortable wearing your sling, there's likely something a little off in the way you're wearing it, so check these videos out to see if you can make an adjustment. There you have it. 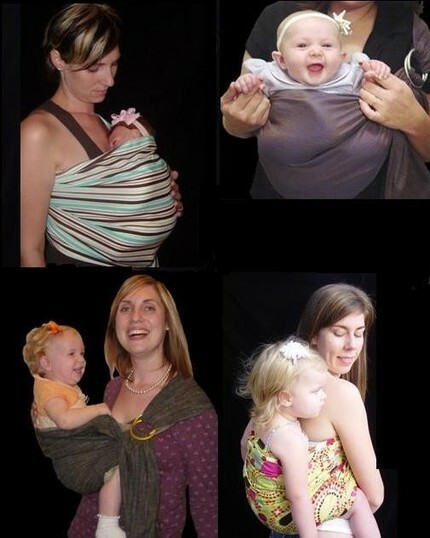 I hope that helps you and your baby be comfortable safe and happy with your slings! Leave me a comment if you have any questions or need any help wearing your little. I posted a month or so ago about my latest interest, bordering on obsession, bento box lunches. I was checking out some bento blogs and found Muffin Tin Mom who hosts Muffin Tin Mondays where Moms make lunches for their kiddos centered around a theme and served in muffin tins. I thought it would be a fun bento-ish style lunch I could do on the days I'm home with Elle, so today was our first muffin tin Monday. The theme was left overs. sorry for the yucky picture... my camera battery was dead and I haven't perfected taking pictures with my precious yet. She had leftover whole wheat penne sausage pasta & cinnamon raisen toast "grass", pretzel rod & string cheese "stems", leftover peas, tangerine sections, & ranch dip "flowers", and a baby carrot "butterfly". It was a huge hit! It all started last October. We were completely ill equipped to handle Elle’s first Halloween in which she trick-or-treated (read: amassed ridiculous amounts of sugary garbage that shouldn’t be considered fit for human consumption). I’m not sure why it didn’t occur to me, that despite her previously healthy relationship with candy (we just never had any in the house), having an entire bucket of it in the kitchen was going to be too much for her 4 year old self to resist. Consequently, after every single breakfast, lunch, and dinner we were subjected to “may I please have candy for dessert… please Please PLEASE!? !” We were forced to implement a “no asking for candy” rule… if she asks for candy, she can be sure the answer will be no. However, I don’t want to create a sweet obsessed fiend who sneaks candy into her pockets any time it’s within arms reach, so if she can contain herself for a day or two in a row we’ll offer her sweets of some kind (we get pretty creative… she thinks tic tacs are some of the best candies around). I simply MUST figure out a creative way to get Elle to give up her candy stash next Halloween. I’ve heard ideas like giving them a dollar per pound turned in, donating it to soldiers, or throwing it away little by little each day (I’d really prefer not to resort to trickery). Let me know if you’ve heard/tried something that worked. So with Easter quickly approaching, all I could think about was how much I HATE CANDY HOLIDAYS!!! I decided to be bold, and forgo candy all together in Elle’s Easter basket. I knew I was going to have to come up with something good if I stood a chance of contending with the “my friends all got chocolate Easter bunnies… where’s mine? !” line of questioning. 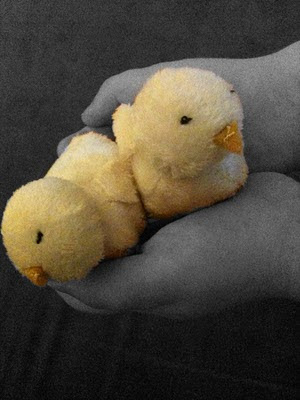 I had been mulling it around for a few days when one of my most favorite blogs, Ikatbag, posted a new pattern she created for… you guessed it… a stuffed chicken that lays eggs that hatch baby chicks!! What?? You didn’t guess that? I stopped just short of jumping up and down and squealing with delight when I saw it. It was so perfect! Elle’s favorite subjects to pretend to be are always animals, and often chickens, she had just been clucking and “laying eggs” on the couch the night before. This was my first attempt at making a stuffie. I was a little hesitant at first, especially because LiEr of Ikatbag is an amazing seamstress, she’s the real deal, and I figured nothing I made, even if it was her pattern, would turn out nearly as well as hers. But I managed to find some quiet time alone with my sewing machine and jumped right in. I couldn’t be happier with how Petunia turned out! She’s just the right size for cuddling, her chickadees sparked a faint memory of my Mom teaching me the French knot when I was young, and the look on Elle’s face when she realized there were chicks in the eggs Petunia laid… oh it was so sweet… not one single time did she even mention candy or chocolate Easter bunnies… mission accomplished! 1)Cut two 14 inch squares of fabric. Minky and Satin is a dreamy combination that makes for blankets with the ultimate cuddle factor! 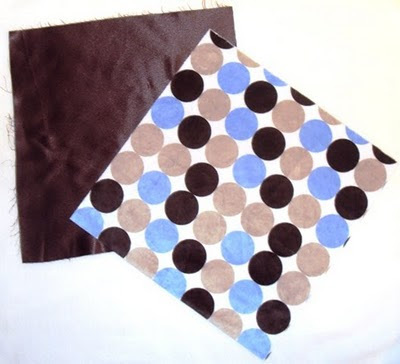 You could use other fabrics like cotton, flannel, or fleece, but once you try Minky and Satin there’s no going back! 2)Cut 12 ribbons that coordinate with your fabric. I use grosgrain, satin, sheer, & velvet ribbons to create a sensory experience. We want the baby to explore the blanket, so mix it up and keep it interesting. I also like some of the ribbon loops to be short & some long, so I don’t cut them each the same length. I do however; make sure they’re not longer than 5 inches because I don’t want the baby to get tangled up in them. 3)Fold the ribbons in half, and pin them, raw edges in line with the raw edges of the fabric, to the right side of the Minky. Pin them so that the ribbons are spaced 3 ½ inches apart. 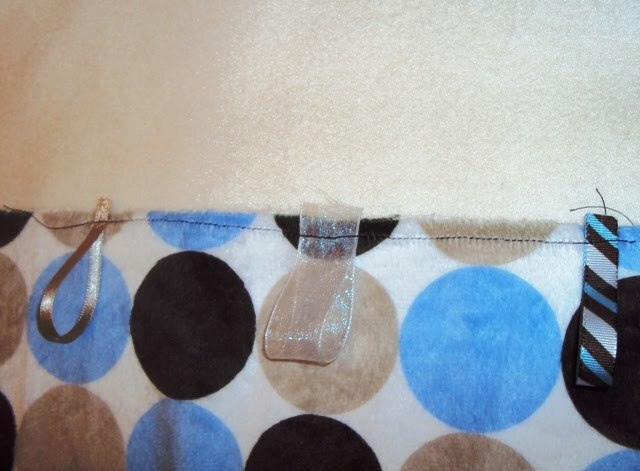 4)Sew the ribbons to the Minky using a ¼ inch seem allowance. 5)Place the satin on top of the Minky, right sides together (the ribbon loops will be sandwiched between the Minky and satin) and pin. 6)Now for the fun part, the crinkle! Add another dimension to your blanket and give it that crunchy feel and sound. You can find some stuff being sold as “crinkle material” online, which is what I use just because I have experience with it, but you can use cellophane too… I’ve even seen someone use a candy wrapper. 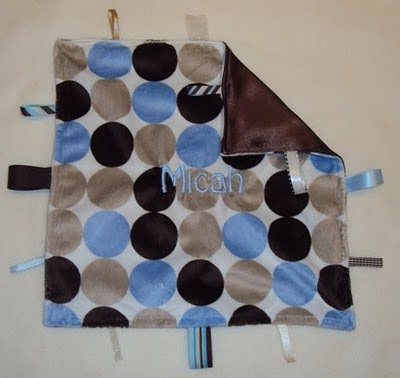 Cut your crinkle into an 8 inch square, fold it in half to make a triangle and pin it on top of the satin in one corner. 7)Sew a ½ inch seem all around the blanket leaving a space between two ribbons to turn through. Be sure you catch both sides of your crinkle corner. 8)Finish the seems. This is an important step because it will prevent the ribbons & satin from fraying and give it that extra strength to stand up to all the play it’s sure to get. If you have a serger, lucky you, definitely use that. 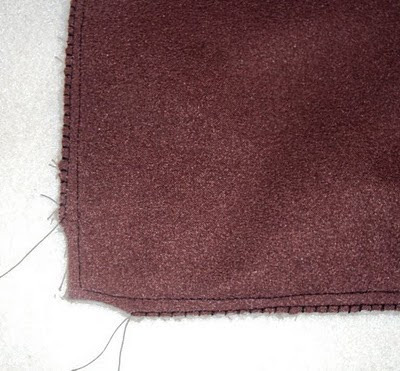 I use an overcast stitch on my sewing machine that’s specifically for finishing seems… but you could use a zig zag stitch if you don’t have that. 9)Turn the blanket right sides out and lightly press. CAUTION: You could scorch the satin and melt the Minky, so don’t use a hot setting on your iron and go quickly over the crinkle or it could melt too. 10)Pin the opening closed. 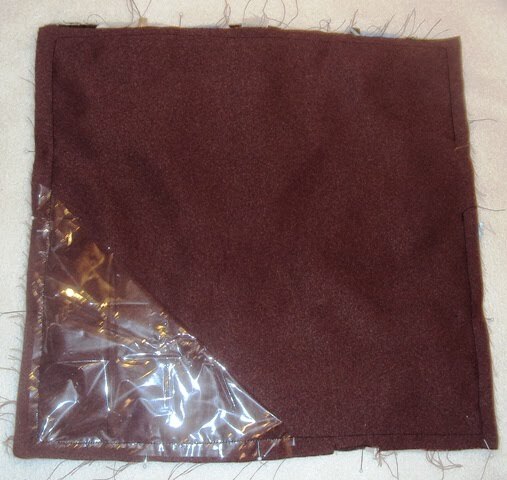 Using a thread the same color as the Minky, top stitch all around the blanket, being sure to close up the opening. 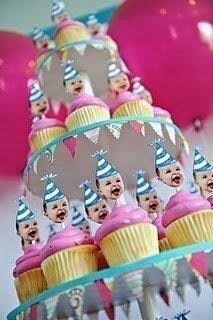 Okay now go be the hit of a baby shower near you!